Immediate opening for employee for Corn farming. Will perform a variety of tasks. Operating Farm equipment. Irrigation with pivots and gated pipe, and basic equipment and shop maintenance. Fully paid group health, 401K. Experience necessary. R Lazy K Inc. Glenvil, NE. Near Hastings. Call 402-771-2394. 6 am to 5 pm. Utility Superintendent: The Village of Trenton is accepting applications for a utility superintendent. Job responsibilities include but not limited to, maintenance, repair, upgrades of all utility systems, heavy equipment operation, water samples, and managing personnel. Applicants must be over the age of eighteen, possess a valid Nebraska driver's license, have a current Class B CDL, and class IV water operator or be able to obtain CDL and water operator. This is a full-time position with benefits. Wage depending on exp. Pre-employment drug screening is required. 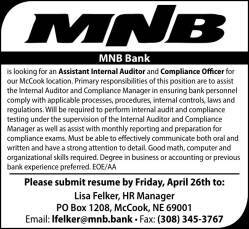 Application may be picked up at the Village Office, 402 Main Street, Trenton or call Village Clerk at 308-334-5488 M-F 8am to 5pm. Applications will be accepted until position is filled. EOE. Full time elevator help wanted in Stratton, Nebraska. Duties will include loading and unloading trucks, helping customers and general elevator upkeep and maintenance. Position includes vacation, sick leave and holiday pay, defined benefit retirement plan, 401K plan as well as health insurance benefit. Would also consider someone looking for a full time summer job. Stop by the Trenton main office at 102 West G Street. Now hiring: Fry Cooks. Day/Night/Mixed shifts available. Apply in Person. MAC'S DRIVE-IN. Looking for waitress, apply in person at Fuller's. Ask for Val or Linda. HELP WANTED Red Willow County is now accepting applications for a Heavy Equipment Operator and laborer for the District 2 Road Department. Shop location is in Bartley, Nebraska. Applications can be picked up at the County Clerk's office in the Courthouse and must be returned by 4:00 p.m. April 30, 2019. Part-time position now available. Must have dependable transportation, be in good health, able to lift 50 lbs, and able to multitask. Must have patience and a love of pets. Will train right person. Apply in person at Pet Pros. Full Time CDL driver needed. Call 345-4264 for more information. Construction and Farm help needed in McCook and Palisade area. Call Roger Goltl 308-737-1000.